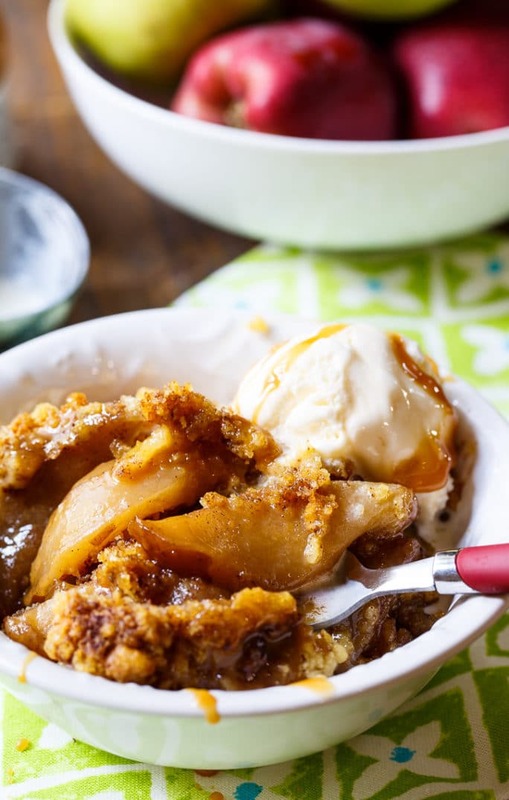 This Slow Cooker Apple Cobbler is made from fresh apples and it is a super easy fall dessert. Only a handful of ingredients are required. Serve warm with a scoop of vanilla ice cream. I love making all kinds of foods in my crock pot, even desserts. 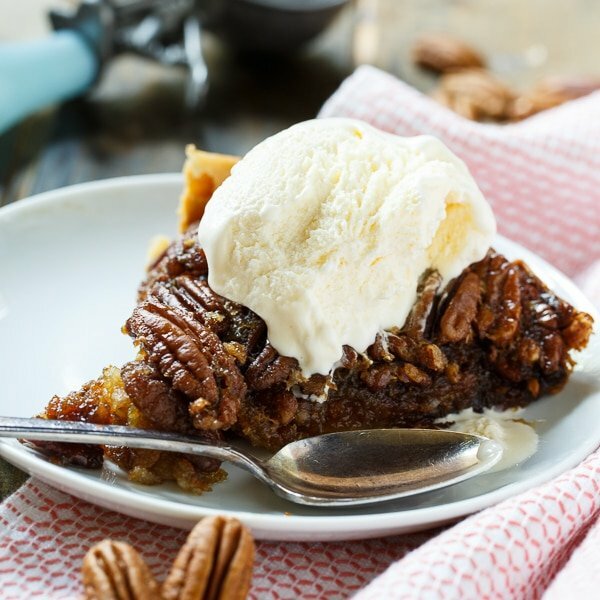 This Crock Pot Pecan Pie is a big favorite! During the summer you’ll find me making Slow Cooker Lemon Cake, but come fall it’s all about the apples. 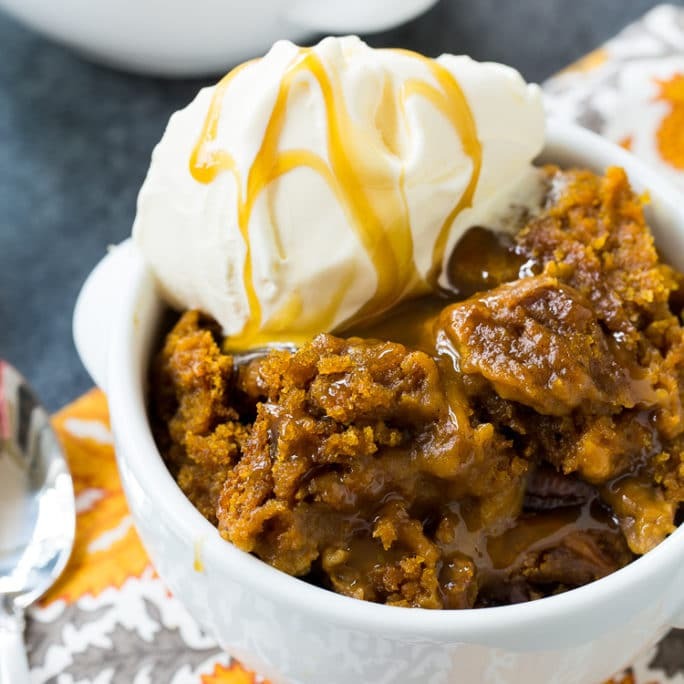 Using a crock pot is a super convenient way to make a dessert. There’s more leeway in cooking time, so not much of a risk of burning anything. This recipe starts with 6 cups of peeled and sliced fresh apples. I use a mixture of Granny Smith and either Honey Crisp or Gala. The apples get tossed with brown sugar, cinnamon, and nutmeg in the crock pot. No mixing bowl needed. Everything is done in the slow cooker for easy clean-up. A box of yellow cake mix (no need to add anything to it) gets sprinkled on top of the apples, along with a little more cinnamon. Finally, 1 stick of melted butter is drizzled on top. 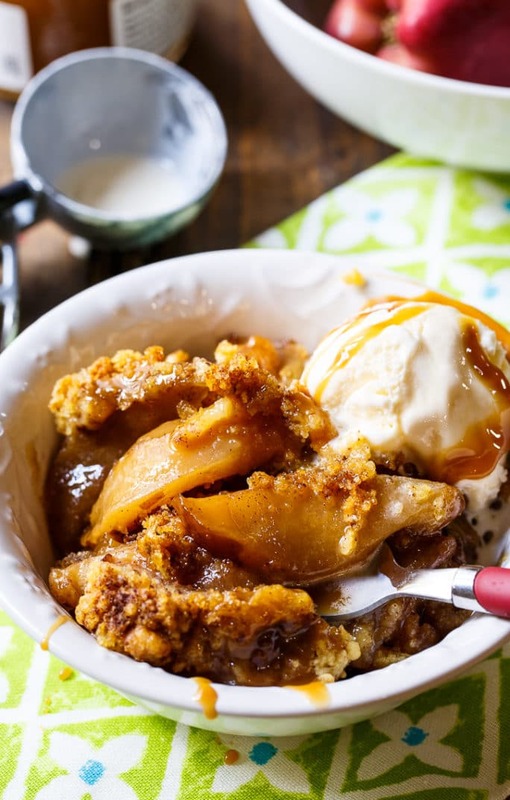 The butter and the liquid that comes out of the apples as they cook, is all the liquid needed to form the dry cake mix into a delicious cobbler topping. Easy Peeazy. 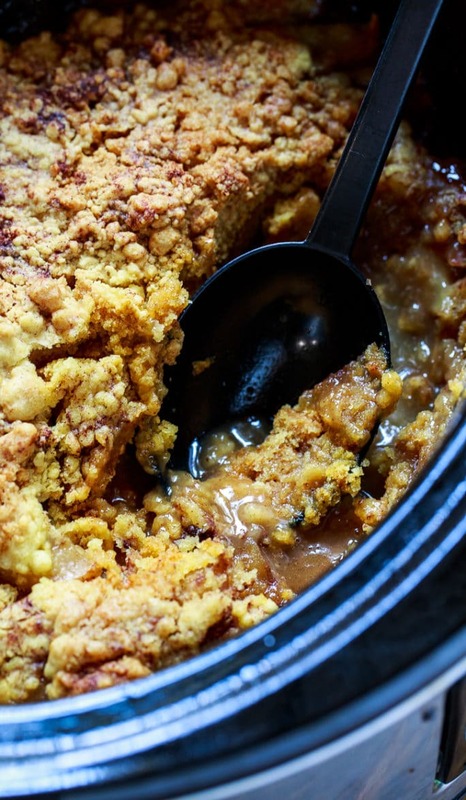 This slow cooker Apple Cobbler just may be your new favorite apple dessert. Never miss a recipe. Follow Spicy Southern Kitchen on Pinterest, Youtube, and Facebook. Sprinkle cake mix on top of apples. Sprinkle remaining cinnamon on top and drizzle evenly with butter. Cover and cook on HIGH for 2 1/2 hours to 3 hours. This entry was posted in Desserts, Slow Cooker and tagged apples, cobbler, crockpot recipes. Bookmark the permalink. Made this for an end of year church meeting for a dessert, and was even asked for the recipe. Did not change a thing, and thought the cake mix, even with the melted butter on top, would still be dry, but no! There was no apple juice at the bottom, and it was perfect, and everyone was asking what the smell was, because it smelled so good! I said, I fixed dessert to celebrate the end of the year, and when the meeting was over, we could have some. Everyone enjoyed it, so thanks! Turned out great! Easy, we used a spice cake mix instead of yellow cake mix and it was amazing. Will be doing this again! Tasteless glop. Cooked for three hours. Mixed butter and cake mix into a crumble. But this is a tasteless muck and waste of time and apples. Right now at the moment I am making this recipe I only realized I forgot to put the cooking spray on the bottom :(. Will it burn??? Making this this weekend! But I’m a little confused, am I using nutmeg or allspice? You had mentioned nutmeg in your dessert into. A few tweaks/comments having now made this twice. Walmart Grocery sells peeled, sliced apples in a big container which is about 6 cups of apples. This is life-changing! 🙂 To make this in my 7qt, large crockpot, I did 1.5 times the recipe as written. The recipe says to pour the cake mix, then drizzle the butter, but I found doing it that way left some of the cake mix in powder form. So I melted the butter and mixed the cake mix with it to form a crumble, then sprinkled it over the top. This worked perfectly. I also just sprinkled cinnamon over the apples and over the top, using WAY more than the recipe calls for. Finally, I added just a smidge of water to the apples- like less than 1/4c, but I felt it needed just a little liquid. I just made this recipe. Turned out zoo food. Some of the brown sugar carmelized on the bottom of the pot and made it even better! This is the second time I’ve made it and both times it turned out perfect! My family loves this cobbler and it makes the house smell delicious while it’s cooking. I took this out of the crockpot after 3 1/2 hrs because it was raw. I put it in the oven and it still mushy. What can i do now? I am currently making this right now! So very excited! Confused. 1/4 tsp of Allspice or Nutmeg? Made this for the family and it is ah-mazing. Super simple and so delicious. Made this today. Recipe was super easy and cobbler turned out just like the picture. Not only was it super easy, but it was delicious too. This is definitely being added to my list of recipes to make again, thanks for sharing. So glad you enjoyed it Colleen! Did u peel the apples? I halved the recipe and have cooked it 3 hours so far. The topping is completely raw and barely warm. I find every slow cooker recipe has half the cooking time that mine takes. I am learning it’s important to adjust recipes based on how your equipment performs. That is very true Audrey. Every crock pot seems to cook very differently. I am making this right now. It has been 2.5 hours and the topping still looks doughy but the sides are bubbling. I do not want to burn the apples. It smells amazing, any suggestions? Too late to help you. How did it turn out? It’s so difficult with crock pot recipes because each crock pot seems to cook differently. For about 20 or 25 people how much of a modification in the receipt would I do? Can you double this in a large crockpot? 6 serving will not be enough for thanksgiving. Yes, you should be able to double it. any reason I can not sprinkle chopped pecans on top of the apples, then the cake mix? I love the crunchiness of the pecans on desserts. Yes, you can definitely add pecans. I love them in desserts too. How many apples (roughly) Makes 6 cups? Thanks! This look so delicious! Can’t wait to make it! This looks incredible! Have got to try it! I think that I am going to try this with peaches! I bet peaches would be really good! This is getting me so excited for fall! 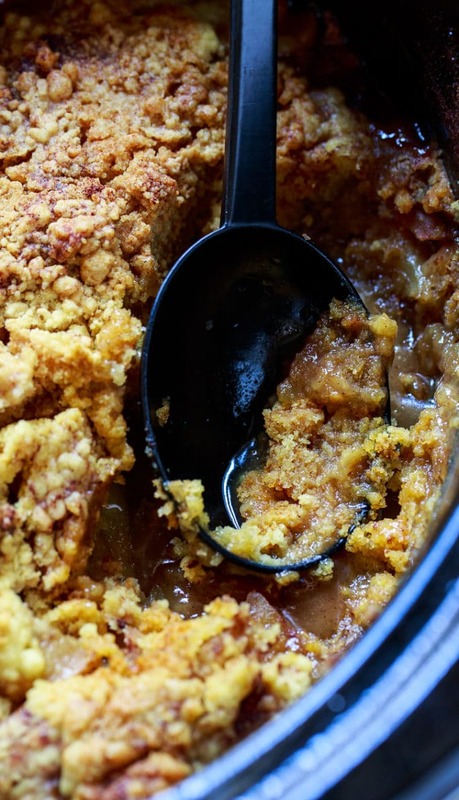 I’ve never made a cobbler in the crock pot before, so I definitely need to try this. Looks wonderful, Christin! Oh I bet this makes the house just smell amazing while it’s cooking!! Perfect for all those fall apples! Every single time you post a slow cooker dessert I always think about how I need to branch out with mine more often from savory dishes! 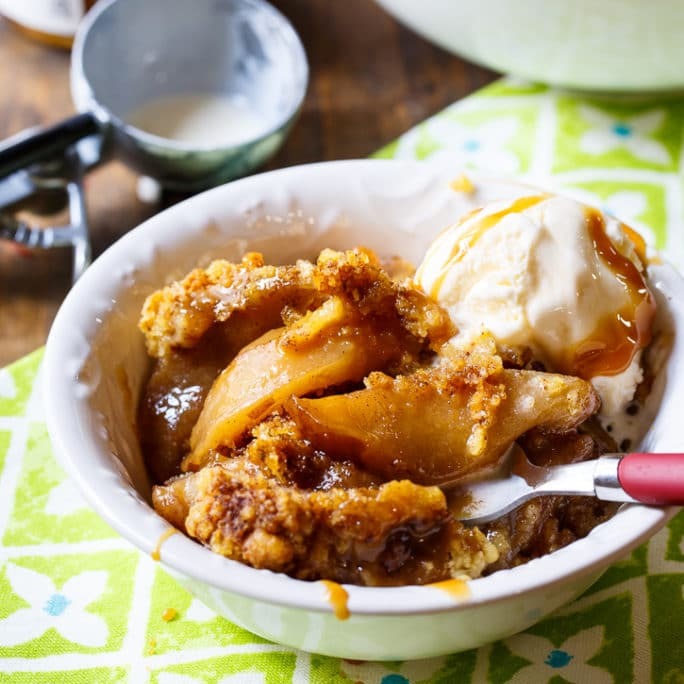 Huge yay for apple cobbler – it’s one of my very favorites!